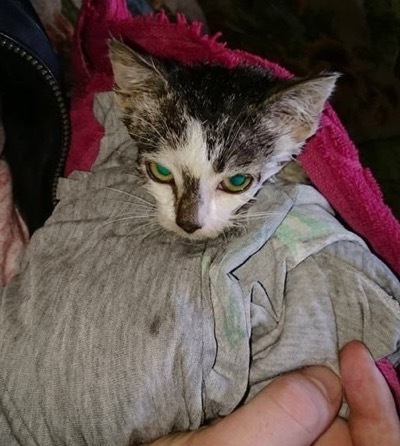 A man spotted a kitten stranded in the middle of a flooded street and immediately leapt into action to save the marooned feline. He ran across the flooded street and scooped up the kitten who was so glad to be out of the cold waters. 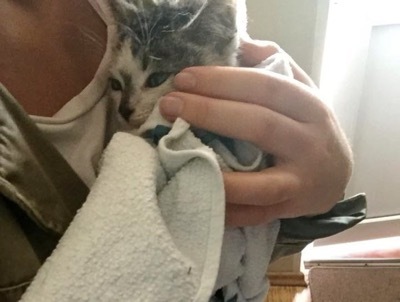 A kind-hearted young woman stepped forward and offered to adopt the kitten. Little Tilk is now in his forever home with lots of food, treats, toys and plenty of love. Click here to see Duchess, the rescued cat that can’t stop smiling!